Strange Music’s first summer smash for 2012 has arrived. 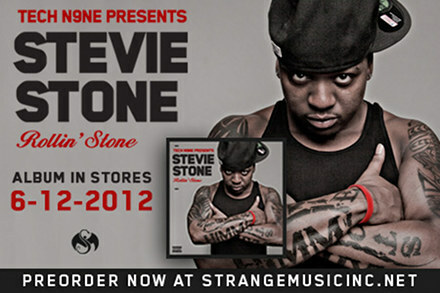 XXL premiered Stevie Stone’s “808 Bendin” featuring Tech N9ne, the debut single from Stevie’s debut Strange Music album Rollin’ Stone. The result is nothing short of a banger. For those of you looking for a track to put your subs to the test, look no further. Over a beat of perfectly-tuned 808 drums, Stevie Stone and Tech N9ne drop a verse each. Stevie’s trademark growl unquestionably establishes him as someone who possesses one of the most distinctive voices in hip hop. Tech N9ne’s verse features him playing with his cadence and delivery in a fashion that is rarely heard (which for Tech N9ne is saying a lot). Look for “808′ Bendin” to be in a club, sub or a party near you very soon. Until then, click here to hear the premiere on XXLMag.com. Click here to pre-order Rollin’ Stone featuring “808 Bendin”.